I used to be a teacher. In fact, I knew I wanted to be a teacher when I was in kindergarten. My sister Rachel, just a year younger than me, was my very first student. She grew up dutifully humoring me in "my classroom" (a makeshift area of our basement) where I taught her everything I had learned in school that day. I'd like to attribute her true genius and great professional success to me but I know it wasn't that. She was born brilliant. When I was in college, I never brainstormed about what I wanted to do when I graduated. I just knew that I was going to be a teacher. I neglected to open envelopes about Rhodes Scholarships and Fulbright opportunities because they would only sidetrack me from what I wanted more than anything in the world to do -- have my own classroom and teach in it. My official teaching career began with professors at Bowdoin who I wanted to be like -- both personally and professionally -- and then with a mentor teacher who is one of the most successful people I've ever met. Hank Ogilby teaches Social Studies at Freeport High School in Maine. He is far too humble to know it, never mind admit it, but I know for a fact that he makes the world a better place every single day. He's another person I want to be like. When I got my first teaching job, I felt like a dream of mine had come true. I was only 22 years old when I took a job at my alma mater. I didn't take a job there because it was the high school I had graduated from but rather because I honestly believed it was the best teaching opportunity. More than that, it felt instinctively right. I've written in this blog and in my book about how and why I left teaching to become a lawyer. For countless different reasons, I will never consider that decision a mistake. Nevertheless, I am ready for my career to continue to evolve, this time away from the law. While I still plan to remain a member of the Massachusetts bar and take asylum cases before the immigration court, I am planning a shift in my "day job." Because I can't think of any way I'd rather spend my days than in a classroom talking about books and writing with high-school students. That first sentence was what had stumped me. I was nervous about being so honest, but I eased my mind with the most important test that I run all of my writing through before I publish it -- "Is it true?" Yes, it was true. I am a lawyer who aspires to be a teacher. Last week I applied to two jobs that start this fall -- both teaching English & Language Arts in a public high school. In the cover letter of one, I described the job as my dream job. It really is. And if cancer has taught me anything, it has taught me that it's okay to admit a dream and have a sense of urgency about it. I get a kick out of the many people who think that I am going back to teaching because I will have more time with my kids or have my summers off. As much as I love my kids and the summer, neither one of those reasons were a motivation for the change, mostly because in my current job I see my kids every morning and every night and we have wonderful summers together. One thing I wish more people knew about teachers is that most of the best ones never even considered summers off when they decided to enter the profession. Oh, and most of them take second or third jobs -- and summer jobs -- to make ends meet. In a way, this post has been almost one year in the making as it was last summer when I decided that I wanted to go back to teaching. I remember the exact morning it all began. It was the morning that I learned that my friend Meghan's breast cancer had metastasized to her lymph nodes and her bones. That morning changed me. For one, Meghan's news made me face the reality more than ever before that my cancer also could come back. I didn't talk about it then and I rarely talk about it now, but I know in my gut it's true. I also know that if my cancer does recur, I want to face it while already in pursuit of those most important things I want to accomplish in my lifetime. 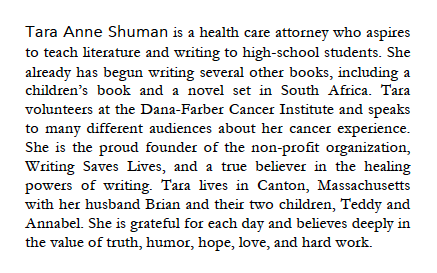 And I knew that morning last summer that my dream wasn't to be a corporate health care lawyer. Honestly, it never had been. One summer afternoon while talking to my mom about my realization, I told her that I wanted to make a change; that as great as my workplace was, I still felt unfulfilled at the end of the day. She patiently listed dozens of lawyer jobs for me to consider. But every one of them left me feeling empty inside. Until we got to teaching. "How about teaching the law?" she suggested. "Hell no!" I replied. "I don't like law students!" I was partly joking, partly not. "How about teaching high-school kids again?" she asked. I hadn't even considered it. I figured that for financial reasons, I couldn't consider it. But my heart immediately welled up with the excitement and fullness that I remembered from years ago when I received rosters of my new classes, or Xeroxed a quiz, or started a new lesson, or wrote on the whiteboard, or saw a concept click with a student (I could go on). I knew it then. As clear as the summer day. I wanted to be a teacher. Of course, the frilly thoughts of "following your dreams" are soon followed by reality. In that reality, I loved the people I worked with and they had been so good to me through my illness and treatment. I felt a sense of duty to stay at the firm and somehow "repay" them. In addition, I had a pro bono immigration case that I had to finish and that case wasn't scheduled to be heard in court until April 3, 2015. I couldn't leave until my client was granted asylum in the United States. The week before last, that happened. Perhaps unsurprisingly, one of the harshest realities of leaving the law for education is a financial one. To better understand the financial implications of my decision, I did the sensible thing -- I downloaded a terrifying app called "Home Budget." One sleepless night last summer, I plugged in all of our family's expenses (gulp) as well as two teaching salaries (Brian's real one and my dreamed up one). There were a lot (like, a lot) of red numbers on that screen and at one point in the wee hours of the morning, I almost cried. But I plugged in a second job for myself and then a third. I even caved to the sad reality that if I made this leap, we couldn't afford to adopt a child any time soon. Eventually however, I had faith that with a lot of hard work, it could be done. I could be a teacher again. And in the summers -- between outings with Brian and the kids -- I could continue to pursue my other dream. I would write. Since I'm on the awkward and uneasy topic of money, I thought this would be a good time to explain that I never ever want my book to be tainted by financial motivations and I have never (and hopefully will never) think of my book as a way to make money. I didn't even think to enter potential royalties into the dream-crushing-home-budget app. 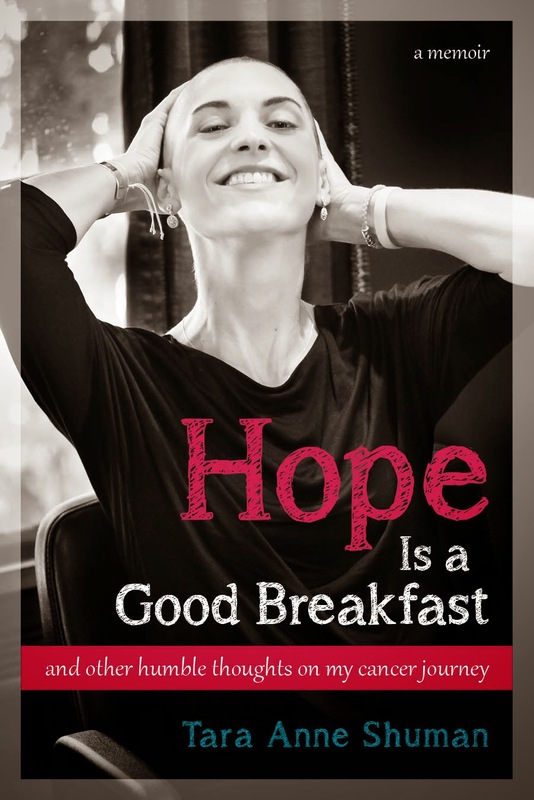 I do, however, believe very deeply in the power of the book's message -- that hope really is a good breakfast, but that we have a lot of work to do before dinner. Because while hope is one of the most powerful gifts I have ever received, there is so much progress to be made in so many different fields -- from environmentalism to medicine to politics to education. That work cannot be fueled by hope alone. Indeed, I believe now more than ever that such work must be fueled by people who feel in their heart and soul that they were meant to contribute something to that particular space. And then, when the time is right (and perhaps scarily uncomfortable), they take a leap of faith. Because when I grow up, I want to be a teacher. And cancer, it turns out, helped me grow up. The Book -- Now Available!